Plans for a 1,400 foot (427 meter) skyscraper designed by Zaha Hadid Architects have been unveiled for midtown Manhattan. 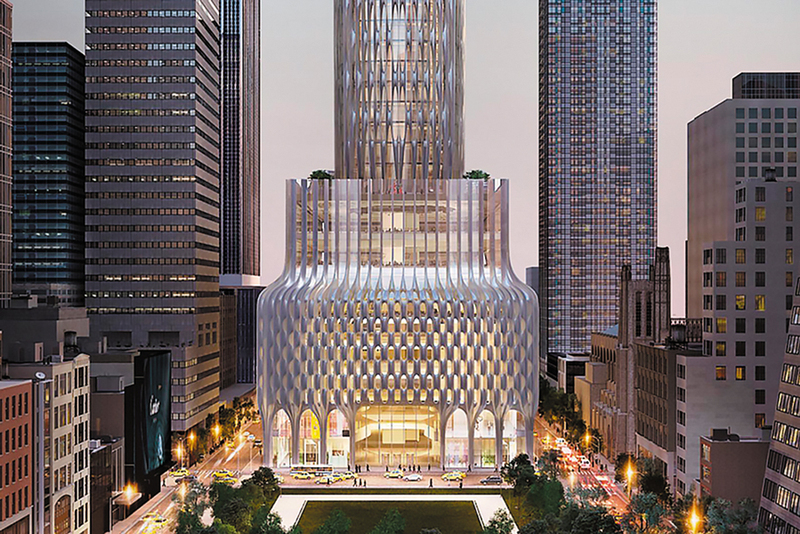 Located at 666 Fifth Avenue, the site’s existing building is owned by developer’s Kushner companies, who purchased it in 2007. The potential scheme would see ZHA add to its portfolio of North American projects, with the high line-adjacent 520 west 28th residences nearing completion. However, the Wall Street Journal reports that the project is far from realization, as a number of factors could scupper the deal. The tower may require additional investment, potentially from Anbang Insurance Group (who are believed to be in discussions with Kushner), while Jared Kushner’s new role as senior advisor to President Trump could be viewed as creating a conflict of interests. Per the WSJ, plans for the skyscraper include stripping the 60-year-old building back to its steel structure. Around 40 storeys would then be added, with the tower housing luxury condos and a hotel, with retail outlets at its lower levels. Work could potentially begin in 2019, with a tentative completion date scheduled for 2025.